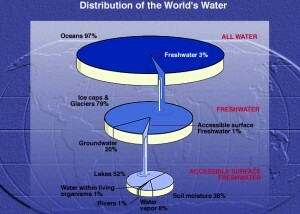 Oceans cover around 72% of the Earth’s surface and contain roughly 97% of the Earth’s water supply. The oceans of Earth are unique in our solar system. No other planet in our Solar System has liquid water although recent finds on Mars indicate that Mars may have had some liquid water in the recent past. Life on Earth originated in the oceans and they continue to be home to an incredibly diverse we b of life. 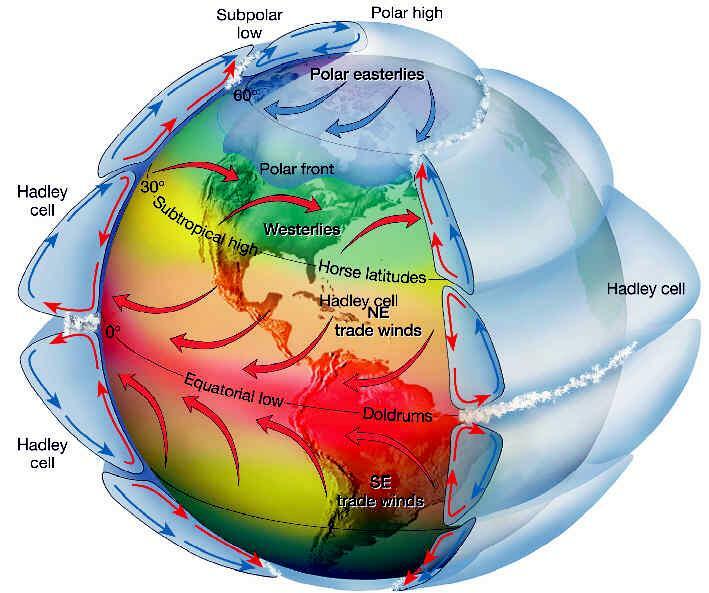 The oceans of Earth serve many functions, especially affecting the weather and temperature. Everything about the ocean is immense with the tallest mountains and the deepest valleys on our planet.. That’s 139 million square miles or 139 with 19 zeros after it and it’s not just wide it’s deep. The world’s oceans are 12,460 feet deep on average. That’s 10 Empire State buildings stacked on top of each other. Most scientists think life began in the ocean over 3 billion years ago. Today, the ocean contains an amazing array of life at every depth. Over 1 million known species of plants & animals live there and scientists say there may be as many as 9 million species we haven’t discovered yet. Marine animals come in all kinds of weird shapes, sizes and colors and they live in all kinds of different environments within the ocean. The largest animal in the world the Blue Whale, lives in the open ocean along with millions of tiny drifting organisms called Plankton. Then there’s the deep sea where it’s as dark as night & icy cold. At depths as great as 7,000 feet below the surface, tube worms live in the most extreme environment in the world in hot sea vents. There, the water temperature changes from scalding hot to icy cold in the space of a few feet. No matter where you go in the ocean, you will always find life. Life in the ocean depends on energy. No animal can move or grow without energy. Most ocean animals get their energy by eating plants or other animals. The connection between organisms based on the transfer of energy is called a food chain or a food web. Most food webs start with the conversion of sunlight into food through a process called photosynthesis. 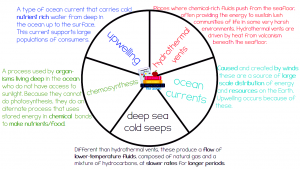 Photosynthesis is an important process that occurs at the surface of the ocean. 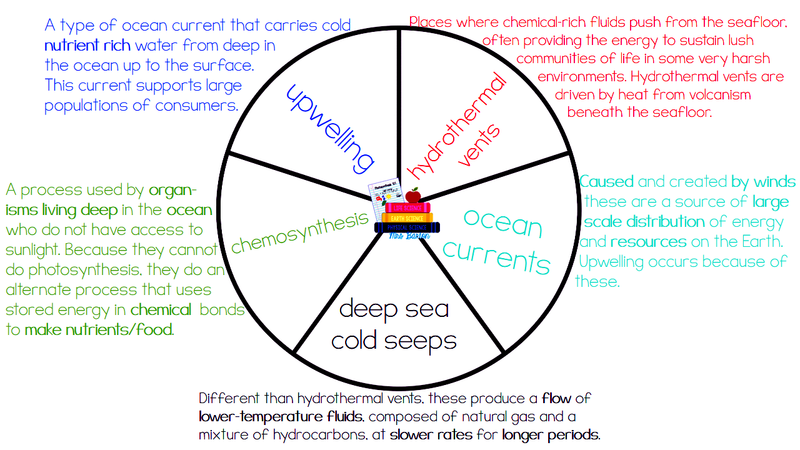 Deep within the ocean at hydro-thermal vents, food chains are based on the conversion of chemical energy into food. This process is called chemo-synthesis. 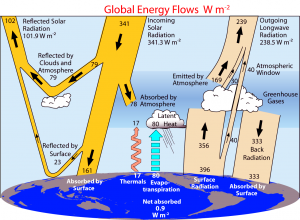 They moderate the Earth’s temperature by absorbing incoming solar radiation stored as heat energy. 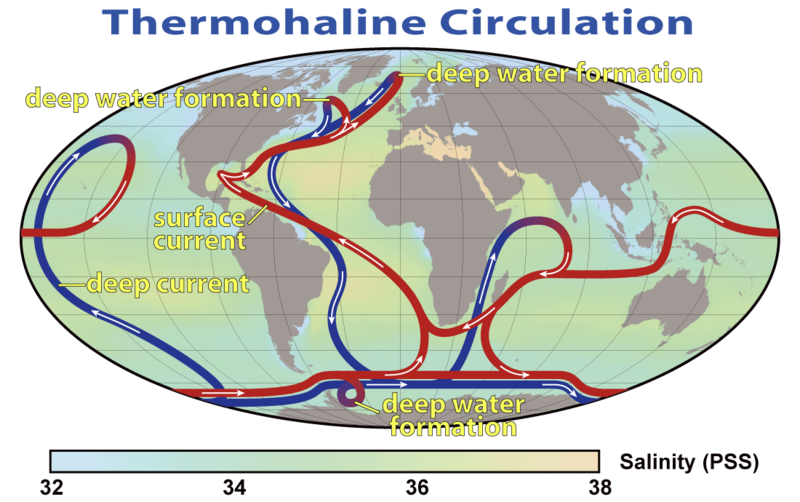 The always-moving ocean currents distribute this heat energy around the globe. This heats the land and air during winter and cools it during summer. The Earth’s oceans are all connected to one another. 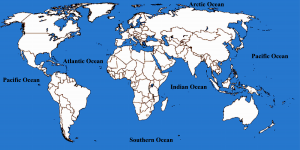 Until the year 2000, there were four recognized oceans: the Pacific, Atlantic, Indian and Arctic. 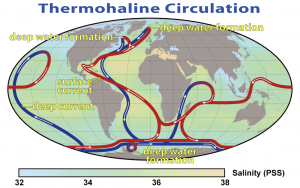 In May of 2000, the International Hydrographic Organization delimited a new ocean, the Southern Ocean (it surrounds Antarctica and extends to 60 degrees latitude). There are also many seas (smaller branches of an ocean); seas are often partly enclosed by land. 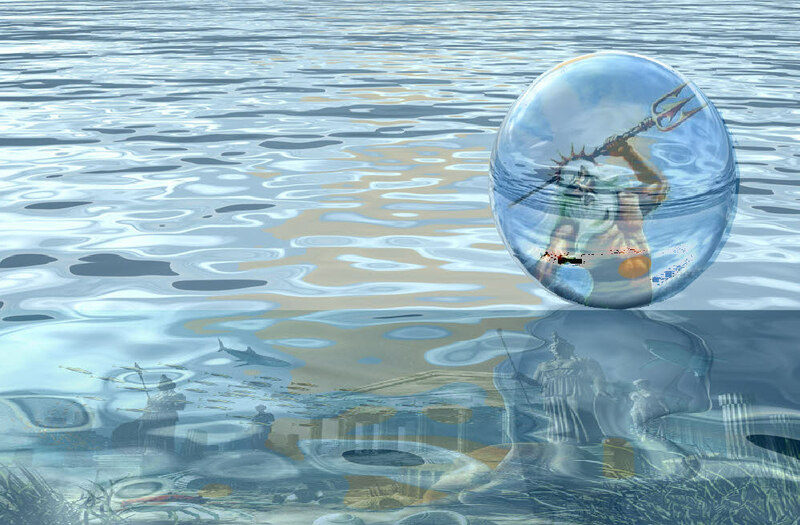 The largest seas on our planet are the South China, the Caribbean and the Mediterranean. As water flows in rivers, it picks up small amounts of mineral salts from the rocks and soil of the river beds. This very-slightly salty water flows into the oceans and seas. 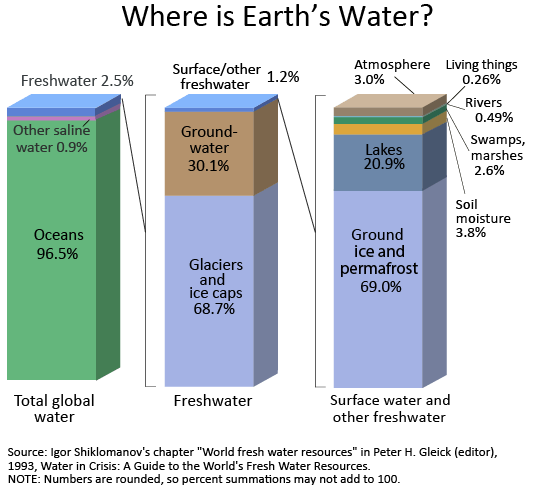 The water in the oceans only leaves by evaporating and the freezing of polar ice, but the salt remains dissolved in the ocean – it does not evaporate. So the remaining water gets saltier and saltier as time passes. The salinity (salt content) of ocean water varies. The oceans and seas contain roughly 5 x 10 tons of salts. One cubic foot of average sea water contains 2.2 pounds of salt. The oceans are about 3.5% salt (by weight). 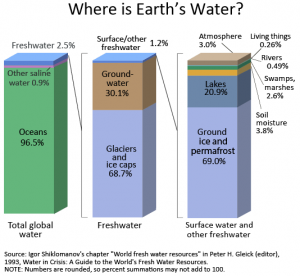 Salinity is generally reported in terms of parts per thousand (abbreviated o/oo), the number of pounds of salt per 1,000 pounds of water; the average ocean salinity is 35 o/oo. The saltiest water is in the Red Sea and in the Persian Gulf, which have a salinity of about 40 o/oo (due to very high evaporation rates and low fresh water influx). The least salty seas are in the polar regions, where both melting polar ice and a lot of rain dilute the salinity. Sunlight is made up of all the colors of the rainbow. Some of the sunlight is reflected off the surface of the water, reflecting the color of the sky. Some of the sunlight penetrates the water and is scattered by ripples and particles in the water (this tinges the appearance of the ocean with the color of the particles). In deep water, much of the sunlight is scattered by the oxygen in the water and this scatters more of the blue light. Water absorbs more of the red light in sunlight; the water also enhances the scattering of blue light. The Red Sea often looks red because of red algae that live in this sea. The Black Sea looks almost black because it has a high concentration of hydrogen sulfide which appears black. The winds cause waves on the surface of the ocean and on lakes. The wind transfers some of its energy to the water, through friction between the air molecules and the water molecules. Stronger winds like storm surges cause larger waves. You can make your own miniature waves by blowing across the surface of a pan of water. Waves of water do not move horizontally, they only move up and down (a wave does not represent a flow of water). 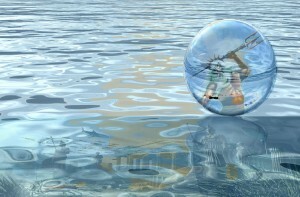 You can see a demonstration of this by watching a floating buoy bob up and down with a wave; it does not however, move horizontally with the wave. Tidal waves sometimes called “Tsunamis” are different from surface waves; they are usually caused by underwater earthquakes, volcanic eruptions or landslides. Tides are periodic rises and falls of large bodies of water. Tides are caused by the gravitational interaction between the Earth and the Moon. The gravitational attraction of the Moon causes the oceans to bulge out in the direction of the Moon. Another bulge occurs on the opposite side, since the Earth is also being pulled toward the Moon and away from the water on the far side. Since the Earth is rotating while this is happening, two tides occur each day. The Water Cycle (also known as the hydrologic cycle) is the journey water takes as it circulates from the land to the sky and back again. 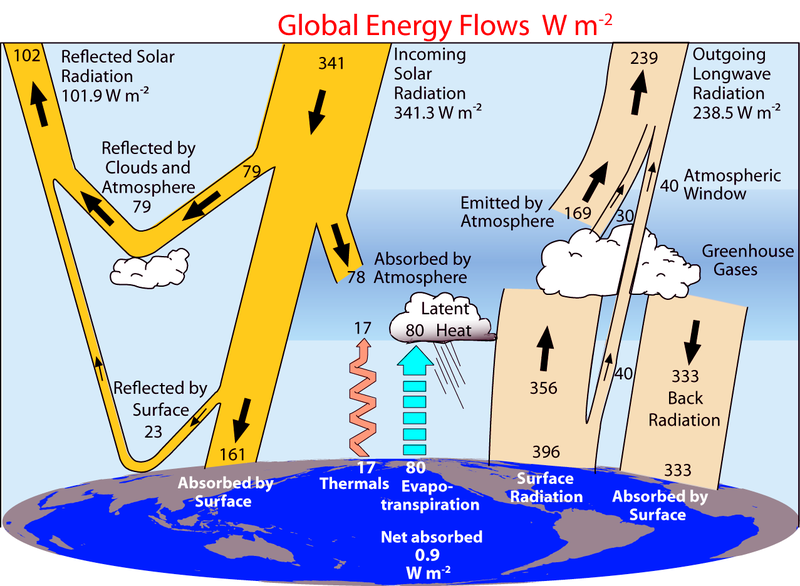 The Sun’s heat provides energy to evaporate water from the Earth’s surface (oceans, lakes, etc.). 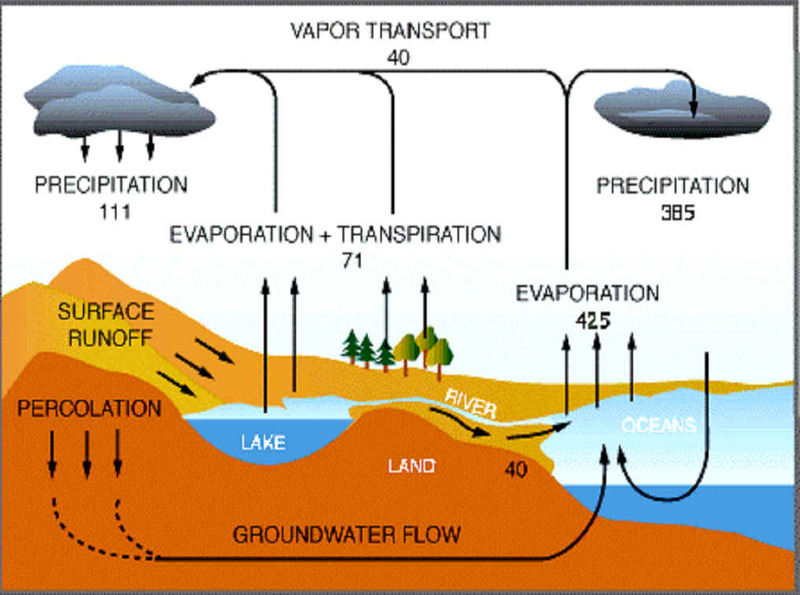 Plants also lose water to the air (this is called transpiration). The water vapor eventually condenses, forming tiny droplets in clouds. 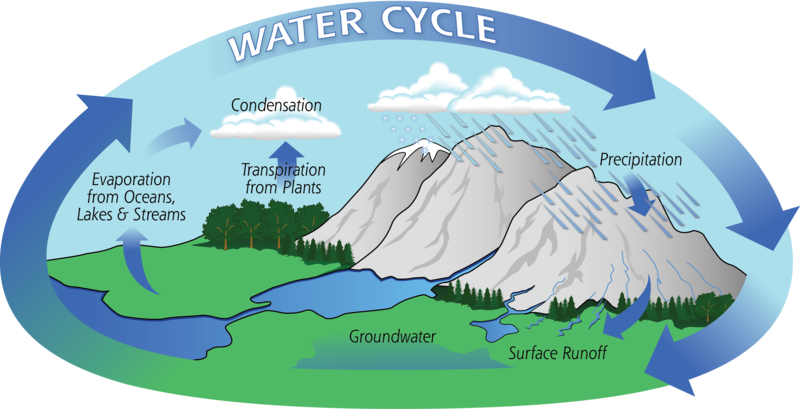 When the clouds meet cool air over land, precipitation (rain, sleet or snow) is triggered and water returns to the land or sea. Some of the precipitation soaks into the ground. 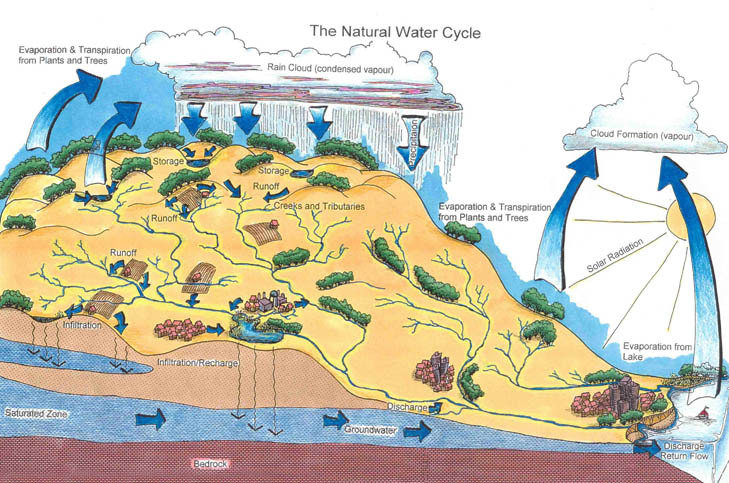 Some of the underground water is trapped between rock or clay layers; this is called groundwater but most of the water flows downhill as runoff above ground or underground, eventually returning to the seas as slightly salty water. The inter-tidal area also called the littoral zone is where the land and sea meet, between the high and low tide zones. This complex marine ecosystem is found along coastlines worldwide. It is rich in nutrients and oxygen and is home to a variety of organisms. The uppermost layer of the world’s oceans is bathed in sunlight during the daytime. This bright ocean layer is called the sunlit zone or the euphotic zone (euphotic means “well lit” in Greek) or the epipelagic zone (epipelagic means “upon the sea”). The depth of this zone depends on the clarity or murkiness of the water. In clear water, the euphotic zone can be quite deep; in murky water, it can be only 50 feet deep. On average, it extends to about 660 feet (200 meters); the depth of the ocean averages about 13,000 feet (4,000 meters). The temperature in this zone ranges from 104 to 27 degrees °F. In this zone, there is enough light for photosynthesis to take place, so many plants and other photosynthetic organisms live in this zone and food is abundant. Photosynthesis is a process in which sunlight and carbon dioxide gas are converted into food (chemical energy contained in carbohydrates) and oxygen gas. Photosynthesis in the oceans creates approximately 90% of the Earth’s gaseous oxygen. Most of the oxygen is produced by phytoplankton. These primary producers also called autotrophs, are the first link in the food chain in the oceans. Because of this food source, many animals also live in this zone. In fact, most of the life in the ocean is found in this zone, although it is the smallest ocean zone in terms of volume of water.